This review does contain spoilers! 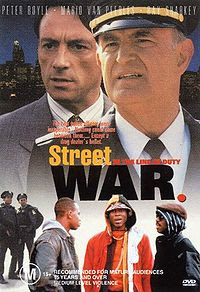 In The Line of Duty: Street War or "Urban Crossfire" is a well-made TV movie. Officers Raymond and Robert (Van Peebles and Boatman) are going after Justice Butler (Vance), an evil drug dealer. Unfortunately, Raymond gets killed by him. Now Robert wants revenge. Butler escapes and now Robert and Detective Reilly (Boyle) have to catch him before he commits more crimes. The acting is good with Peter Boyle and Courtney B. Vance standing out. The writing and directing is standard. No surprises in this story. Overall, it's worth seeing for the acting. One of Lowry's other movies is The FBI Murders (1988) which is also recommended.